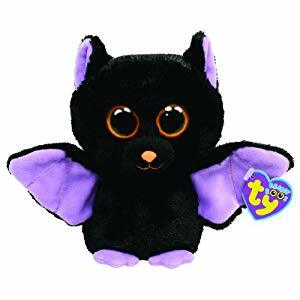 Swoops is made from a fuzzy black material with purple wings and feet and purple inside his ears. He has large orange and black button eyes and a pink button nose. And I sometimes rest hanging in a tree! Swoops was introduced in July 2011. His birthday is aptly on 31st October 2011. The German release of Swoops does not have a birthdate or a poem inside the swing tag. This is the small 6″ version of Swoops. He was also released as a medium 9″ Beanie Boo Buddy. There is also a later version of Swoops that features orange glitter eyes. An owl Beanie Boo called Swoops was later released.